Hey folks. I'm going to Austin, Texas this weekend for Matt Patrol's wedding. I'm going a day early to sight see and I was wondering from those that have been before, what are the "must see" things? I've been to Austin 4 or 5 times. there's a bridge where about a million bats live (the largest man-made bat-living place thing in the world) and at dusk they all fly out at once, it's quite a marvel. Make sure you ask all the locals where the tower where the guy shot everybody is, they love that. There's a picture of GW shaking hands with the owner in there. And they have obscure soda like Bubble Up. Thanks tep. That bat bridge sounds really cool. I'll bring an umbrella. I loves me some Tep. Colony, that's the word I couldn't think of. They built a sort of museum around it, with bat information all over the place. They eat over a ton of mosquitoes every single night, so the residents of Austin can sure thank them for that. Your mom is a "weird figure of the dark"
I can neither confirm nor deny that my mother was once Batwoman. Dr. Medulla wrote: I can neither confirm nor deny that my mother was once Batwoman. 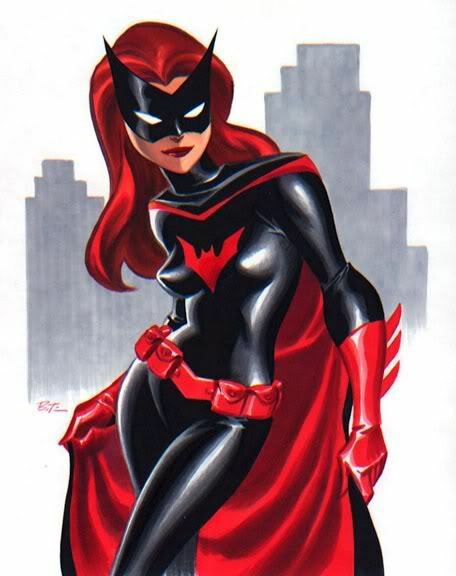 When she was first introduced, Batwoman screamed "gimmicky" but she's actually been a pretty good character. Still problematic in some important ways, but overall fairly decent. I'll give props to DC on that one. I've actually heard good things. Went to Austin for a family wedding a couple of years ago - got me a can of armadillo soup to show for it! The Driskill Hotel is worth wandering around and seeing the decor, there is a bar that advertises 'fish and chips' and you actually get fish and potato chips (crisps) I laughed at the waitress when she brought them out - quite possibly the worst meal I ate in my life. There is some good BBQ places, Ironworks and Rubys are two I recall enjoying. There is a Joe Strummer mural up somewhere along Guadalupe Street near the university and there is an above average English pub not to far away from that area - The Dog and Duck.